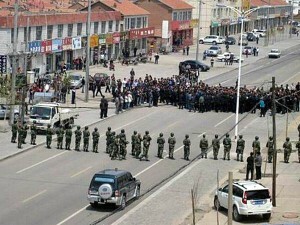 At the time of writing it seems China’s rulers have succeeded in quelling a daring weeklong wave of street protests in Inner Mongolia. This has been achieved by imposing martial law in the region, backed up by overwhelming force, but also by some deft political footwork from the regime’s representatives, particularly by the provincial party chief ‘Little Hu’ Chunhua. His statements have given at least the appearance of meeting some of the protesters’ demands. Hu is a rising star of President Hu Jintao’s ‘Young Communist League’ faction. His actions since the crisis erupted after the killing of two ethnic Mongol farmers (in separate incidents 10 and 15 May) by coal industry employees, are a text book example of what the president calls ‘social management’ to defuse potential flashpoints. The provincial government ordered the closure – temporarily – of some coal mines and a round of government inspections. A senior local official in the region near Xilinhot, where the protests originated, has been sacked and vague promises have been made to ‘improve’ the protection of the region’s threatened grasslands, home to traditional sheep and goat herders who belong to the Mongolian minority. 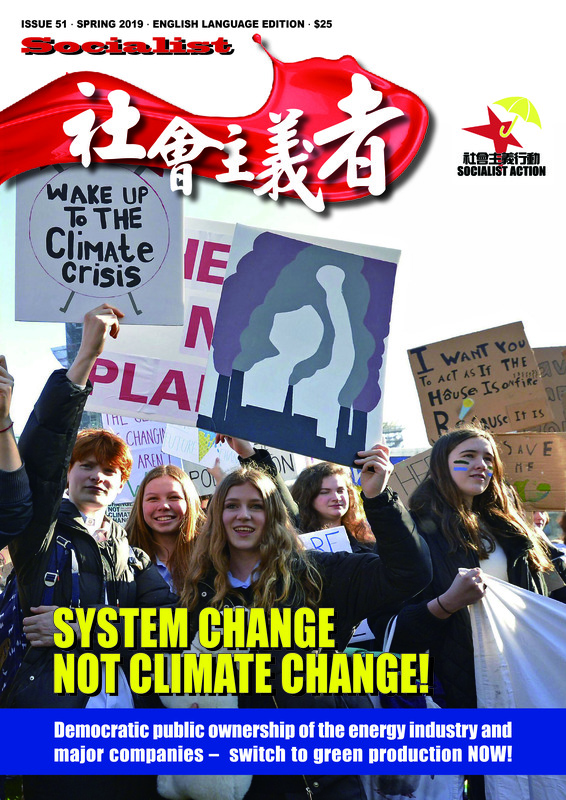 The Beijing-based Global Times, a government mouthpiece, encapsulated the ‘carrot and stick’ approach of the authorities, saying the protests were economic rather than political and that some – it did not specify – of the protesters’ demands were “reasonable, and should be responded to by the local government”. Mongols make up around 4 million of the region’s 20 million population, with a further 2 million Mongols in the independent state of Mongolia across the border. The government’s ability to deliver on its promises will now be put to the test. Socialists place no trust in the Chinese dictatorship on this score, or the crocodile tears of journals like Global Times. Past experience shows that notwithstanding the regime’s desire to avoid social conflict, the pull of moneyed interests that criss-cross the party-state’s own internal structures is what determines developments, especially at local level, once an immediate ‘crisis’ has be defused. In Inner Mongolia the problem is the uncontrolled and rapacious appetite of the coal companies (over 350 companies in total) in what is now the biggest coal-producing region in the world’s biggest coal market. Any notion that ‘Little Hu’ and his party faction represent a less repressive line is dispelled by the massive show of force used to back up the Inner Mongolian government’s ‘listening’ approach. Thousands of paramilitary police and even regular troops have been deployed on the streets of major cities and students have been forcibly confined to campuses – effectively imprisoned in school buildings for the duration of the crisis. Social media and micro-blogging services have been unplugged. Therefore it’s a case of ‘small carrot and big stick’ as far as the regime’s ‘social management’ is concerned. Despite the repression, there were reports of smaller isolated protests at one or two universities and even an attempt to march in the provincial capital Hohhot last Tuesday – although martial law was already in force. Such defiance is an ominous sign for the one-party dictatorship – this vast ‘autonomous’ region (bigger than France, Spain and Portugal combined) has not seen political instability for three decades. The trigger for these protests was the killing on May 10 of an ethnic Mongolian herdsman, Mergen, who also seems to have been a leading figure in a group opposing the encroachment of coal mining companies onto traditional pastoral lands. 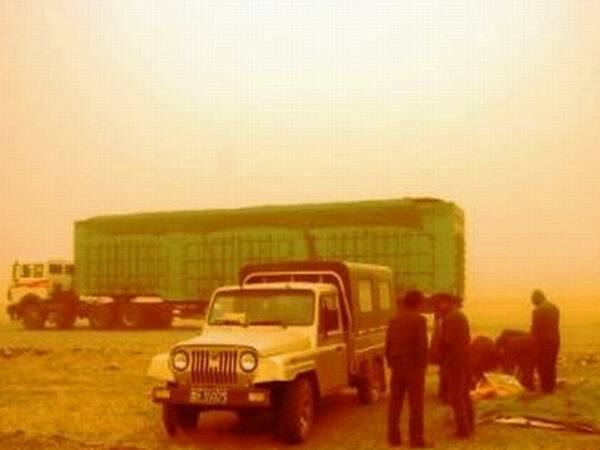 His brutal killing, widely believed to have been deliberate and even racist inspired, under the wheels of a coal truck (his body was dragged for 150 meters), became a symbol of the struggle between the new lords of Inner Mongolia – the mining interests – and the traditional nomadic way of life on the Mongolian steppes. The furious expansion of open cast mines is destroying grazing lands and livestock and wiping out the possibilities of ethnic Mongolian farmers to survive economically. May is the lambing season and the thunderous intrusion of the coal trucks across pastoral land can cause sheep to miscarry, with economic losses to herders. Mongolian herder shave banded together in an attempt to stop the coal convoys. Five days after the first killing, a second herdsman was killed in a clash with mining employees. This became the spark for street demonstrations by herders that were swiftly joined by ethnic Mongolian students and school students. The main slogans of this movement were “defend our land and defend our rights”. Students and other protesters were angered by official attempts to buy the silence of Mergen’s relatives by offering compensation in exchange for an undertaking not to ‘make trouble’. This practise – bribe and threaten – is set piece for the Public Security Bureau in such situations. Another reported demand of the movement has been for a monument to be built to Mergen, now revered as a martyr. 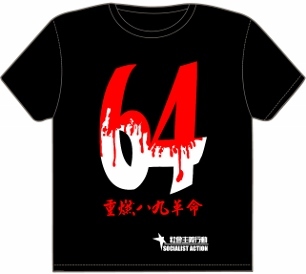 The Chinese state is always anxious to keep a lid on protests, but this is especially the case in the run up to the sensitive June 4 anniversary (of the 1989 Beijing massacre). On Monday May 30 the ruling Politburo held a special meeting to discuss ways to strengthen ‘social management’. This year’s budget for the public-security apparatus has reached the astounding sum of 624.4 billion yuan (US$95 billion), a jump of 13.8 percent over last year and more than China’s total military spending of 601.1 billion yuan ($91.5 billion). Rapid growth – but who gains? 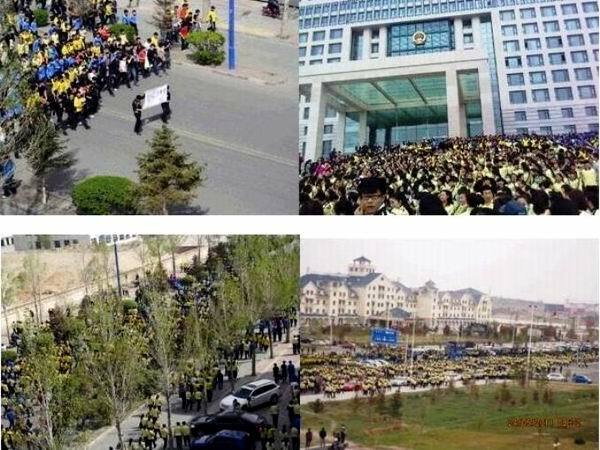 The outbreak of large-scale youth protests in Inner Mongolia took the Chinese regime – and most commentators – by surprise. This is because Inner Mongolia has been held up as a “model autonomous region”, due to rapid coal-driven economic growth but also because according to Beijing it represents “ethnic harmony” between Mongols and Han Chinese. But the region suffers from an all-too familiar mixture of out-of-control industrial expansion, shocking environmental degradation, mass land seizures and economic policies that disadvantage ethnic minorities (as wealth is transferred from the poor to the rich, which favours capitalists and officials from the dominant ethnic group). The province has undergone an unprecedented boom in recent years. Province-level GDP grew by 16.9 percent last year as Inner Mongolia overtook Shaanxi to become China’s biggest coal producing region. But this represents a manic and unplanned industrial expansion that carries a gigantic environmental and social cost. The city at the centre of Inner Mongolia’s coal boom, Ordos, is now wealthier than Beijing in terms of per capita GDP [a government survey published on June 6 shows Ordos has even overtaken Hong Kong in per capita GDP terms]. But it is also world famous for its ‘ghost town’ construction binge with tens of thousands of empty properties that have been bought up as ‘investment objects’ to cash in on the coal boom. The neighbouring city of Kambashi, for example, with enough newly-built homes to house 1 million people, is said to have only around 30,000 inhabitants – barely enough to fill the city’s new stadium! Meanwhile, ethnic Mongolians but also many Han Chinese farmers and workers feel a growing resentment as they are squeezed out by this development. China’s coal addiction – it provides over 70 percent of the country’s energy needs – is ruinous. Socialists advocate democratic planning which would make possible a massive and fairly rapid switch to clean energy. China has already become the world’s major producer of wind power turbines and equipment from almost nothing five years ago. But China’s already considerable wind power capacity is for the most part not connected to the electricity grid and therefore wasted. Likewise, an explosive expansion of solar cell production in recent years has failed to impact on China’s unsustainable energy mode (it has actually worsened coal dependency as most solar cells are exported, leaving production areas in China with considerable levels of environmental waste and an even bigger coal bill). The economy’s lopsided reliance on coal, which has spawned the current frenzied ‘Klondike’ rush into Inner Mongolia and other coal regions, also demands a correspondingly huge and costly investment in other fields such as railways (one quarter of all trains in China carry coal), roads, bridges, etc. While some of these projects are warranted and bring positive benefits, many are wasteful and unnecessary if an alternative planned approach was adopted that put people’s needs at the centre. And the headlong rush by local governments to build more, bigger, faster, in order to attract investments (and the fat bribes that accompany them), raises major issues of quality and safety. Building supplies and construction companies cannot keep up with current demand, leading to substitution with inferior ‘tofu’ materials and the waiving of legal regulations. The ‘lubricant’ of unprecedented levels of corruption completes this picture of mayhem, presented as ‘development’. No wonder many youth, and even some regime-friendly intellectuals, speak of the ‘tyranny of GDP’. A socialist government would focus on extensive, safe and ‘green’ public transport systems and social housing – for rent not purchase – in all cities. It would prioritise a reorganisation of the energy industry, based on democratic planning and control. It would scrap vanity projects and give local communities and workers’ organisations a veto right over new projects where serious environmental concerns are raised. 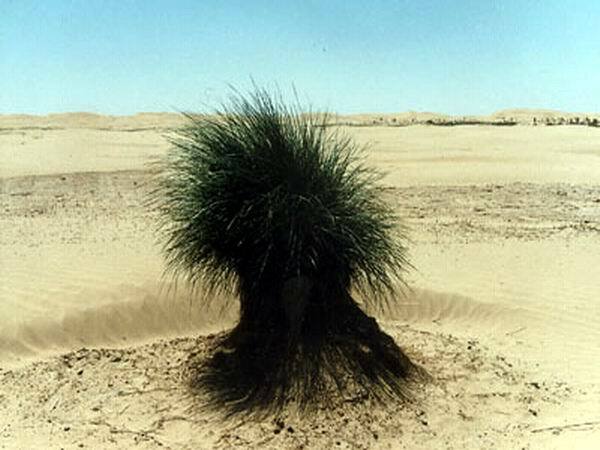 Inner Mongolia suffers from some of the worst desertification of grasslands anywhere in the world, with the Gobi Desert expanding at a rate of 2.4 percent a year. This comes from a confluence of different factors, local and global, such as unsustainable farming methods, over grazing, under-invested and wasteful irrigation systems, deforestation, and not least climate change exacerbated by China’s coal addiction. One of many environmental missteps has been the eradication of the region’s wolves on the grounds of protecting livestock. This is a theme covered in the best-selling book Wolf Totem by Jiang Rong. The demise of the wolves has led to a proliferation of the rabbit population, which in turn has caused widespread destruction oflocal grasslands. In recent years the provincial government began relocating more than 250,000 nomads from grasslands on the grounds this is necessary to protect the region’s ecosystem. Inevitably, with a top-down undemocratic approach, this policy is unpopular with ethnic Mongolians who fear further marginalisation. Many herding families have been getting poorer and poorer and based on some calculations average per capita income for ethnic Mongols in Inner Mongolia has fallen below the equivalent measure in traditionally much poorer Mongolia. The protest movement in Inner Mongolia provides a valuable insight into how the youth in particular are facing up to the greater repression in China today. It was reported that the protesters organised themselves at the very last minute in an effort to outwit the authorities. Once a protest site was chosen, word was spread by mouth to gather in shops and other buildings nearby, before moving to the march site. These steps and improvisations are impressive. But to consolidate and preserve the experiences from this protest movement – both practical and political lessons – it is necessary to organise seriously, not rely on loose or ad hoc groupings. Socialists advocate the building of a workers’ party and independent unions that are democratically controlled by their membership. The national question is an important issue in Inner Mongolia as in other minority regions of China. What is also clear, however is that the ethnic Mongolian protesters have not emphasised their movement as an ethnic movement, but as a movement of poor farming communities against reckless and law-breaking corporations. Instinctively, it seems, many of the protesters have understood the need to win support from their Han Chinese neighbours. The region is unlike Tibet or Xinjiang, with their segregated communities. Inter-marriage within ethnic groups is quite common in Inner Mongolia. 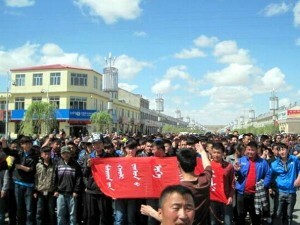 The protests also seem to have succeeded in winning sympathy from the local Han population, as shown by the fact the government crackdown has imposed restrictions on schools for both Mongolian and Han ethnic groups.The debate around China on internet chat sites shows overwhelming support for the Mongolian protests, with many commentators drawing a parallel to the movement against land seizures by Han Chinese farmers and in particular to the murder of Han land activist Qian Yunhui (also deliberately run over by a truck) in Zhejiang province earlier this year. Whereas in Bahrain and in other Arab states hit by revolutionary movements this year, the ruling elite have consciously whipped up ethnic division in order to split and defeat the masses, the Chinese authorities are at this stage avoiding this approach, fearful of the long-term ‘destabilisation’ of minority regions. 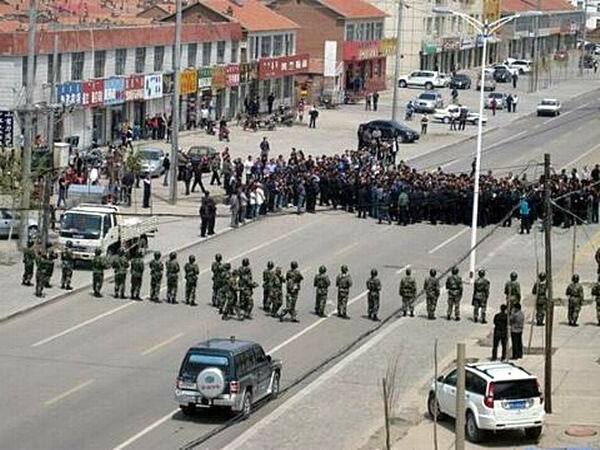 This is what happened in Xinjiang and Tibet, after brutal crackdowns in 2008 and 2009, where rule from Beijing is facing increasing costs and uncertainties. For this reason the ‘ethnic’ dimension has been downplayed by official media in Inner Mongolia. 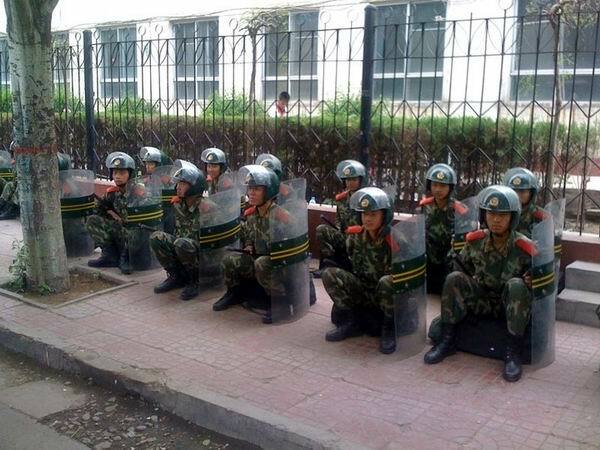 The Global Times said comparisons to Tibet and Xinjiang over the past three years were “improper”. “Social conflicts are on the rise in China and ethnic minority areas are no exception. But the incidents there should not be exaggerated or over-interpreted,” it said. But the regime’s actions – of aggressive corporate expansion, rampant corruption and widening wealth gap – inevitably increase tensions in society, including inter-ethnic tensions. Only a joint struggle by workers and poor farmers of all ethnic communities against this capitalist agenda, for democratic rights and a socialist alternative, can offer a way forward.